Peavey's 6505 MH mini tube amp head packs all the tonal tenacity that the 6505 series is known for, and it's got what it takes to be a gig-worthy guitar amp, too. You'll never have to worry about showing up to a gig with bad power tubes, because the Tube Status Indicator tells you how they're doing at a glance. Send your tone directly to the PA system with the Mic Simulated Direct Interface, with a speaker defeat switch to turn off your cabinet for lower stage volume (or for silent practice with headphones). And with footswitchable channels, crunch, reverb, and effects loop, you've got all the flexibility you need with the Peavey 6505 MH. 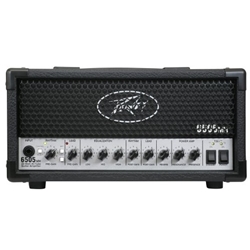 With two footswitchable channels, the Peavey 6505 MH sets a solid foundation for most rockers and metal guitarists. Each channel has separate pre- and post-gain controls for fine-tuning your tone. And the rhythm channel also has a footswitchable crunch mode that's perfect for putting some hair on a clean tone. Factor in a footswitchable reverb and effects loop, and you've got a lot of flexibility in the 6505 MH. We've had the great opportunity to get to know Hartley Peavey here at Remix, and we know that Peavey approaches guitar amp design with the goal of making the amps sound as unique as your playing style. The 6505 MH definitely has an aggressive sound to it, as well as a fast and sensitive response, but it doesn't have a specific, defined voice. Spend some time with it, and you're sure to come up with a sound that is distinctly yours. We keep referring to the 6505 MH as a gig-ready amp, and we mean that Peavey designed this guitar amplifier with long-term performance in mind. Proper tube maintenance isn't the favorite activity of any guitarist, so the 6505 MH's Tube Status Indication makes it much easier to make sure your amp is always ready to rock. We know that sometimes a direct output is a much better solution than miking up your cabinet, and the 6505 MH's Mic Simulated Direct Interface makes it easy to plug directly into the PA with respectable tone. From practice to recording to performance, the Peavey 6505 MH is the kind of amp you can count on.